Anime Boston took place on March 30 to April 1, 2018 at the Hynes Convention Center in Boston, MA. The annual springtime convention utilized the entirety of the convention center and neighboring Sheraton and Hilton hotels. The convention keeps growing every year and shows no signs of stopping anytime soon. This year, we saw guests such as FLOW, Asaka, Kaoru Wada, Kazuki Yao, and Yuji Muto from Japan. We also saw plenty of American voice actors and behind the scenes crew responsible for dubbing anime. Greg Ayres, Stephanie Sheh, Mary Elizabeth McGlynn, J. Michael Tatum, etc were among the many voice actors that came out to New England on Easter weekend. This year’s theme was “To the Stars,” playing it back to the series finale episode title of Robotech: The Macross Saga. 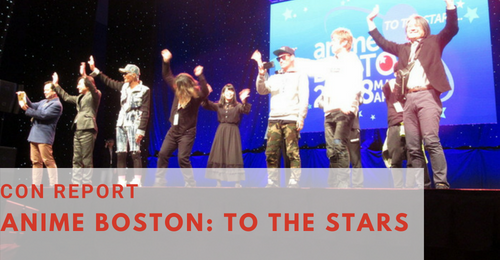 This is our fifth year covering Anime Boston and it keeps getting better and better!